… to try out Tageba. This is a hobby project, and I would be very happy if it turned out to be useful for others. I appreciate all feedback, and if you have ideas for improvements, it’s more likely than not that I will implement them. Tageba currently is in its infancy, so please be patient if something doesn’t work as expected or you encounter problems (I do appreciate bug reports, of course). If you do like it, I’d be very happy if you would share it online and with friends and family. I updated Tageba today and added a new feature: You can now set up goals. A goal has a reward attached to it and optionally has an expiration date. This is how you set up goals: You click on the ‘Goals’ button in the accounts overview. You can enter the amount that wil be rewarded once the goal has been met, a description and optionally an expiration date. With an expiration date, a goal expires automatically on that date and can no longer be obtained. You can approve or reject a goal by clicking on the corresponding buttons. When you click on Ok, the reward is automatically deposited into your child’s account. When you click on ‘Reject’, the goal is closed and can no longer be obtained. You can confirm or reject the goal, just like above after creating it. Once you do, the reward will be deposited in your child’s account. With goals, you can give your kid a sense of achievement and focus. Also, since they are easy to set up and can’t be forgotten about, you can work with much smaller goals than before. The most important is an incentives system, where parents can set up certain goals and assign a (monetary) award to them. Say, you want to motivate your kid to keep their room tidy or help with the chores. With this feature, you can set up these goals, and once you check that a goal is reached, the associated reward will automatically be deposited into your kid’s account. This creates not just a very immediate positive feedback, but also allows your child to see the long-term effects of their actions. A related new feature will be one-time automated deposits and withdrawals. Say, you want to give money to your child, but only after a certain date (e.g. because you want them to spend some extra money only after a difficult test in school has gone by). In this case, this is not a regular, recurring deposit, like an allowance. With this feature, you can set up such things and decide whether your child can see the upcoming event beforehand or not. And I plan to make the whole allowance mechanism more abstract. It will be turned into a general system of standing orders that you can fine-tune with specific repeat periods and conditions. Finally, I plan to incorporate goals and ‘buckets’ you and your kid can set up for saving money. For example, your kid may want to buy an expensive toy which currently is out of their monetary reach. They can set up that toy and its price as a goal, and see daily how close they are to reaching that goal. And you and your kids can set up buckets which will receive a certain percentage of incoming money. For instance, say your kid wants to donate some money to a good cause. Together you decide that 10% of their income should go towards charity. With Tageba, you will be able to allocate 10% of all money that goes into their account to this ‘bucket’. The money will be protected from withdrawal, and will only be available for the specific purpose it was allocated for (checked by you upon withdrawal). That’s it for today’s back log. You have more ideas for future features and improvements? Great – let me know via the contact form, and I will be very happy to hear from you. And to keep up-to-date with upcoming features, you can subscribe to the newsletter. You may wonder how exactly Tageba works. It’s actually quite simple: Once you register, you can create accounts for your kids. 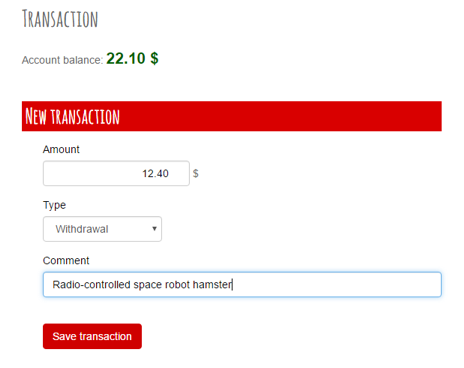 Each account has a balance and can keep track of transactions. A transaction – i.e. 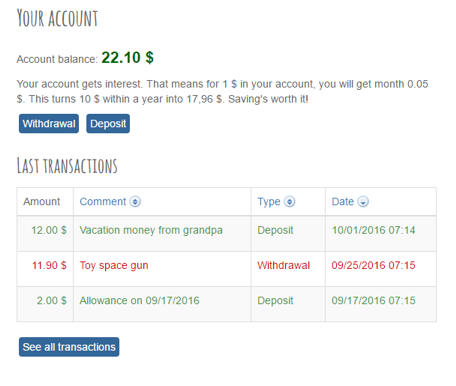 a withdrawal or deposit – is something you enter on the website when your kid asks you to. Of course, for withdrawals, you check first whether there is enough money in the account. And so can your child. This enables them to keep track of where their money goes, and how much they still need to save until they reach a specific goal. There is a dedicated frontend of Tageba for the kids. When they log in, they see a simplified version where they can look up past transactions and request withdrawals and deposits.